Sometimes an album lands in your inbox from a band who are waist deep into their career and it’s the first time you’ve heard of them. Poets of the Fall are such a band. 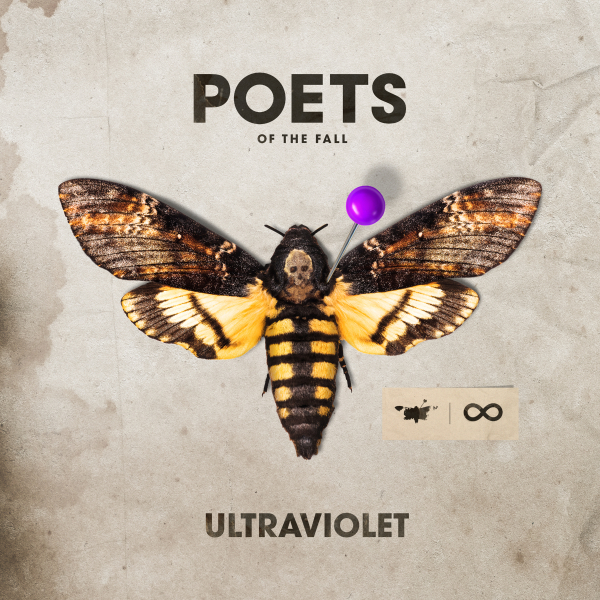 Ultraviolet is their eighth album and by the end of opening track “Dancing on Broken Glass”, it shows. This is a slick, polished band who know how to work with each other and get the best out of themselves to make the music they want to. Describing themselves as “cinematic rock”, it certainly seems a good fit for them. A number of the tracks on this album could appear on your typical indie/artsy-fartsy/punch-you-in-the-feels film. Most of the songs are upbeat numbers with production and electronic/industrial style giving the songs a light, airy feel. However, they do provide some tense moments such as “Angel” where it is something akin to if Tears For Fear made a track for Blade Runner. Indeed, whilst you could apply the term “industrial” to them, it’s not all as dark as that. There’s a more alternative and pop sound to them, almost as if Foo Fighters’ poppiest moments were chucked into a blender with 80s pop. There are naturally some catchy choruses and the guitars may take a backseat for the most part but there’s a caveat to that: they’re still there. There’s still a bite to it all. What keeps it anchored to the rock genre is the drums, when they’re there, being as beefy as any you’d expect on a rock album. “Standstill” contains some scratchy blues riffs undercut with surf tones to give it that blend of opposing sounds found on the album with the electronics reined in. Its juxtaposition with “The Sweet Escape”, then, is a clever move as they go to the other extreme. It’s a sombre, dark and borderline sultry track with a hint of danger to it. Meanwhile, “Moments Before the Storm” balances both vibes excellently with what appears at first to be a more balladic and electronically-led song but then the guitars kick in towards the end. Not as pop-leaning as earlier in the album, there’s some proper heft and weight to Poets here. Elsewhere, “In a Perfect World” has a mid-noughties pop punk feel to it with its acoustic tones. Swap out Maarko Saaresto’s tempered vocals for a more nasal-based approach and it’d be a perfect fit for an album from 10-15 years ago. Ultraviolet sounds like an album trying to do too much but it works perfectly. Whilst I don’t believe in “Summer” albums, it definitely would a great one to listen to in the late evenings on a long drive as the sun sets. There’s definitely a pop flavour to the album but it’s still recognisably rock. It’s just showing how broad the term “alternative” can be.